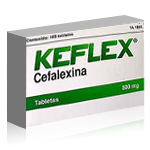 Keflex (cephalexin) is a cephalosporin (SEF a low spor in) antibiotic. It works by fighting bacteria in your body. Keflex is used to treat infections caused by bacteria, including upper respiratory infections, ear infections, skin infections, andurinary tract infections.